Amy and I spend a good amount of time working on external projects. In fact, we discussed at the beginning of this year what we wanted to focus on. For me it has been wrapping up my Pluralsight Course for vRO, as well as, working on extending Tintri APIs to meet business use cases. For Amy, it’s been knee deep in automating the world at UCMC, as well as, working and discussing ideas around community and charity work that we hope to start early next year. For the rest of this year, we are going to now continue our Real World Cloud Series and given the rise in AWS ,which does not seem to be slowing down, we’ve decided to get going on a series focused around AWS. We are going to start off in the IaaS services first, expand these into the automation and service catalog discussions that we have on a day to day basis. After that we will continue on to gather AWS certifications. I will also be blogging about this on the Ahead blog site from a higher level and business standpoint. There are tons of useful posts there from many of my colleagues whom I work with so definitely check it out. In some cases, both pages will share some of the same blog posts but hopefully this helps if you are just trying to focus on the exam. It will all become clear as the posts start to come out in the next few months. 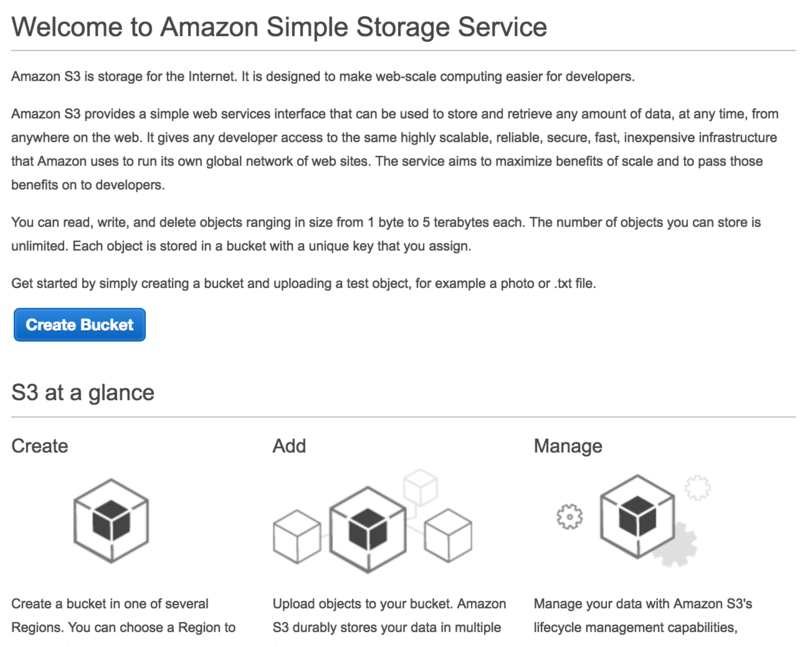 Before diving into the other AWS services, it is highly recommended that you gather a strong background in all of the AWS Storage services and their specific use cases. In this post, we will be discussing AWS S3 specifically. In short, S3 provides highly scalable object storage. In 2013, Jeff Barr , wrote a blog which stated that Amazon S3 had reached over 2 trillion objects and there were 1.1 million requests a second. I’d love to find an updated stat but this in itself gives an indication of how widely used this service is already. For anyone not familiar, object storage provides the ability to store objects (obvious I know). These are essentially collections of digital bits. This could be a document, digital photo, xml file etc. Object storage offers highly reliable and easy scalable storage of all these digital bits but there is basically no structure at all. It simply provides storage and differs from file storage which provides additional functionality. An example is something like update functionality. In a typical file system, you can append information directly to a file. In object storage, this is not the case. You can add an object and retrieve it immediately but you can’t change it. Rather, you have to update the object and then reinsert it. You can still apply permissions and versioning as we will see soon but as you architect applications today, you need to consider whether or not you truly do need a file system. 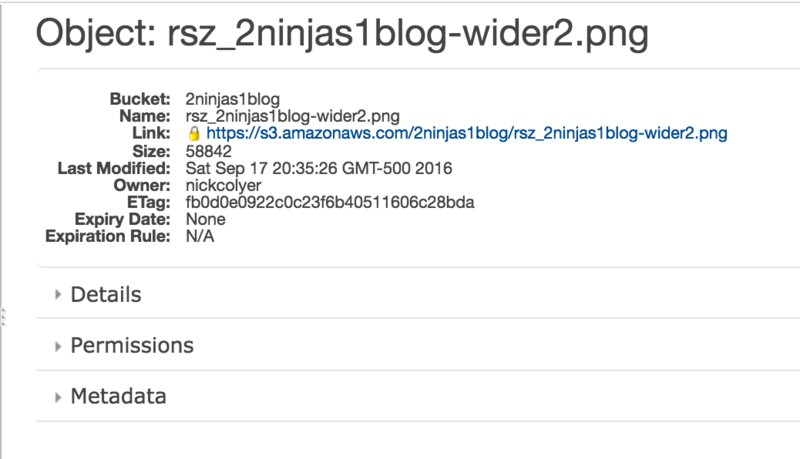 Amazon did recently release EFS (think NAS basically) and this can potentially satisfy your specific file use cases. It is still early on though and the verdict is still out. 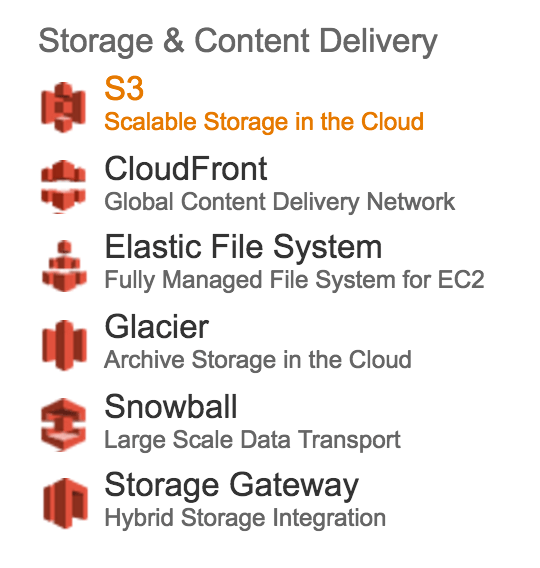 First login to your AWS console and you will see on the left hand side under “Storage & Content Delivery” the icon for S3. The first thing to note is the term “Bucket”. It helps to think of a bucket basically as a folder but the name of the bucket is globally unique. Once someone takes the bucket name, it is not available for anyone else to use. Simply select Create Bucket and type in a name for your new S3 bucket. If someone else has the name already, it will error out and let you know. The name of the bucket also needs to be in lowercase. Once created, you will see the main S3 management screen. You can see on the right hand side a number of options which we will come back to in subsequent posts. For now, if we click into our bucket, we will see that it is empty. 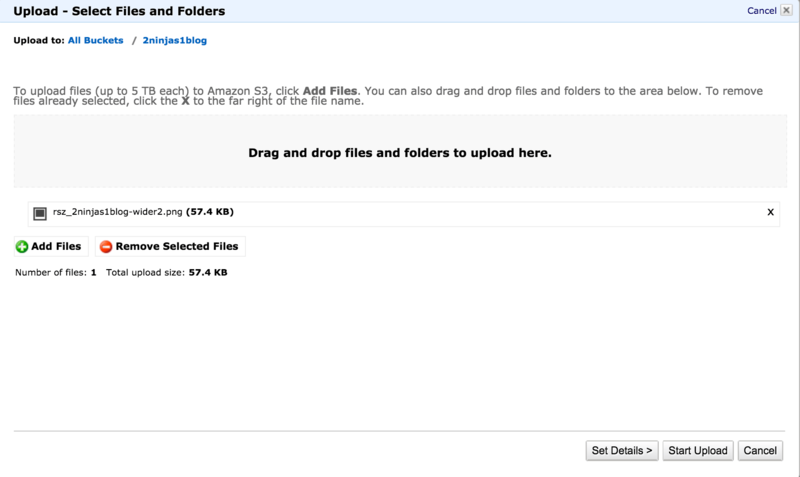 We can create additional folders inside of our bucket or simply begin to upload files at this point. If you select the Actions menu, you will also see additional options. Let’s go ahead and upload a file. In my example, I will simply select a PNG image file as per the screenshot below. Before we go ahead and start the upload it is worth clicking the Set Details button. You can see here that we have additional storage options we can apply. For now, we are going to select Use Standard Storage but there are ways to further reduce cost if the other storage options apply. There is also an option to use Server Side Encryption. Go back and select Start Upload. Once completed, we will see our image file appear on the left hand side. Note the link. If I put this into my web browser directly, I get the following Access Denied error. …I end up now being able to access this image publicly. With that, our basic primer comes to an end. In the next post we will discuss the different storage types and permissions we saw above. A few people asked me recently why some of us are using the hashtag #cloudlife and what it means. This came out of the Ahead Tech Summit presentation I was preparing for and worked with Nick Rodriguez on in June. I was explaining to Nick my concept and he created this great image. Ultimately, it comes from a belief that Cloud is about creating a true experience. This means not just changing the way customers of IT consume services via a catalog, but going that extra mile. I’ll get on to roles and more Cloud Design topics in a future post .The one thing I want to stress over and over is that our goal in creating a Cloud is to create this place people come to for IT services and leave feeling like they got something more. 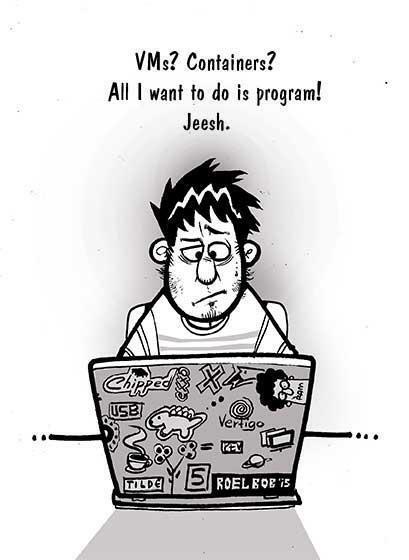 If you’re an IT person, you must put yourself in the developers shoes and try to think of the pain and annoyance they actually go through when submitting a form. They wait weeks for their server to come and they then still have to go to subsequent teams to get various pieces of software installed such as: DR options approved, extra storage and so on. Then, they have to make sure that everything they did in Dev works in QA and finally Production. A sysadmin might push a patch out or a VM template that doesn’t work as it did the previous month because someone else made a change. Follow this up with the sheer amount of Public Cloud PaaS services and other external services the teams wish to consume. Many of these services require security approvals and perhaps additional firewall and networking configurations. It all adds up to a frustrated customer and in turn ultimately affects the businesses ability to innovate and grow. The opposite is the #cloudlife experience..
It’s not about just having the best programmer and engineering the best back end services but the full end to end experience. How you design the front end menu, how you guide every decision the user makes, and how you can get them what they need to be successful and grow the business are front and center. It takes a combination of people and skills to execute on this successfully. Take an example of a Developer that has deployed an environment of SugarCRM, an Open Source CRM tool. Great they deployed it from their request catalog but what if they want to synchronize data from one environment to another for testing? Previously, they would have had to put in a request for someone to backup and restore the database to the new environment. This could then involve a piece of paper being handed around between teams until the task is completed. The alternative is an option like the screenshot below in vRealize Automation. We add an Action which is visible in the items list that gives them the ability to execute this operation with one click. 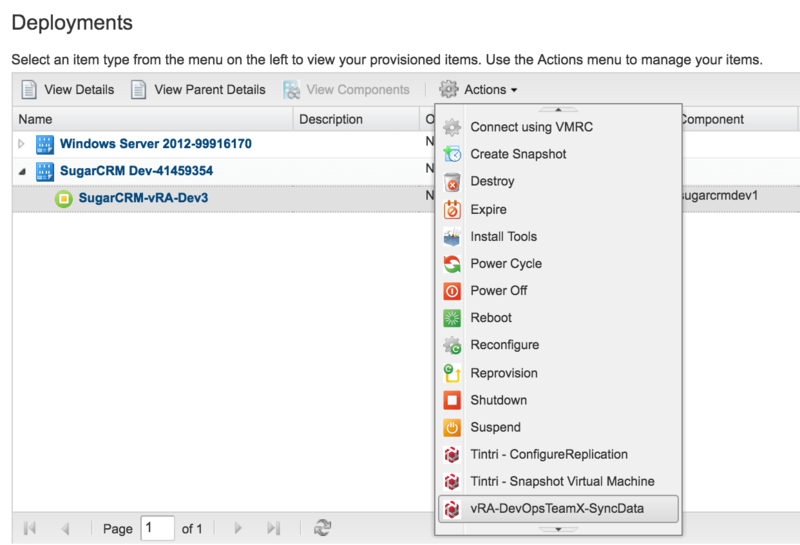 Clicking the “vRA-DevOpsTeamX-SyncData” Button initiates a vRealize Orchestrator workflow. This workflow in turn connects to a Tintri Storage Array to initiate a Sync VM. The workflow will create all the appropriate change controls, shutting down of VMs, storage array tasks etc. Again, think of everything that you need to do to complete the task and provide it as a self service option. Time permitting, some of these will turn into blog posts as well, but here are some examples of clear services you can offer to make peoples lives easier. This means getting everything they need. Not just a VM deployed. Event Based Orchestration – e.g. AWS Lambda to SNOW, Orchestration systems etc. These are just a handful of ideas. Remember, with each one, we’re taking out the additional paperwork by automating the tasks you’d typically do in your ITIL tool like ServiceNow. It’s certainly also become a #hashtag we use whenever we are working on Cloudy stuff (e.g. creating a cloud proposal while in the dentist chair…wasn’t me) or thinking about a new innovative Cloud idea while drinking a Tim Carr Starbucks Iced Green Tea (#notpropertea). Essentially, it’s a way of thinking beyond our Infrastructure roles and what the requester is asking for to create something more. #cloudlife is about reaching for the best possible user experience. One that doesn’t feel like it’s forcing you into a box but instead feels refreshing end enjoyable.